Analog Artist Digital World: Analog Artist Digital World sketches are on display at West Elm. Analog Artist Digital World sketches are on display at West Elm. 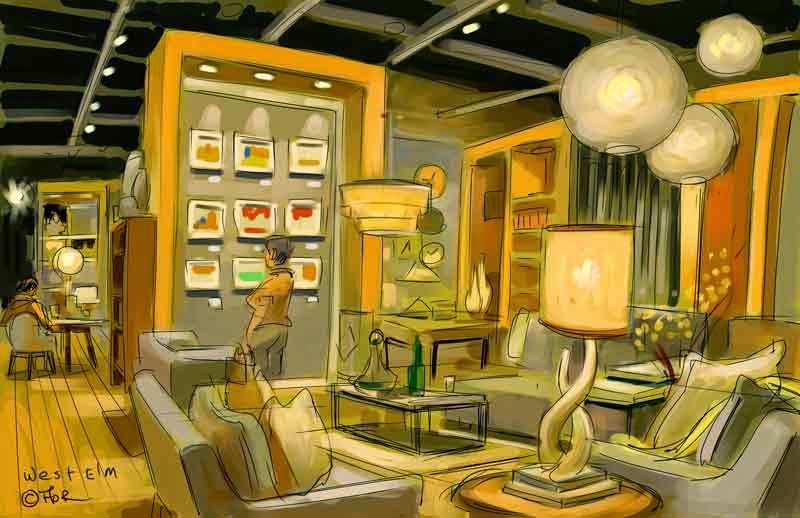 Nine original sketches from the Analog Artist Digital World archives are now on display at West Elm, 4010 Conroy Road, Orlando, FL. The store offers modern home decor and modern furniture. Here you'll find the bedding, furniture, room decor, and dinnerware you need to create a stylish contemporary home. The store is right near the Millenia Mall and Ikea, so if your shopping for Christmas, stop by and see some original art. Patrick Kahn from Snap Space curated the display. The work will be on display through the holidays and into the New Year. I executed this sketch digitally since I felt it might be awkward to use watercolors in a store. I also chose to sit on my artist's stool rather than on one of the comfy couches. Jason Moore is the store manager who hung the show. He recognizes the importance of social media to spread the word about West Elm. I had planned to sketch a Christmas light display on this day, but rain made me realize I needed to sketch inside. It seems any time I choose to sketch outside, the weather has other plans for me. The store wasn't particularly crowded on this evening right after rush hour. One couple however was diligently looking for a new piece of furniture for their home. When the sales lady asked, "So what sort of style furniture is in your home now?" "Our entire home is full of West Elm furnature." was his response. While sketching the store I got a strong sense of the warm uniformity of every item in the store. The color of the sketches on display were bright notes that broke up that uniformity. I was happy to see one woman stand in front of the display for the longest time. It made me happy that the work could be seen in a real world, brick and mortar setting. However, I just came back from Art Basel in Miami where a Pablo Picasso plate worth $85,000 had been stolen. The plate was smell enough where it could be slipped into a hand bag. I realized the woman viewing my work was holding a shopping bag large enough to hold one of my framed originals. Luckily that thought did not cross her mind.